A PRODIGIOUS talent who enjoyed a tremendous Rangers career but it could have been so much better had it not been for Neil Simpson’s horrendous challenge in 1988 which put him out of the game for nearly three years. Elegant, skillful and a man of vision on the football field. Durrant was a Govan boy and joined his boyhood team the Light Blues while still at school. After coming through the Rangers training and coaching system he made his debut at Morton in April ’85. The following season saw the youngster established as a permanent fixture and scored his debut goal in his debut Old Firm contest at Ibrox. Graeme Souness’ arrival meant Durrant would have sole use of the No. 10 shirt for the whole of the 86/87 season. 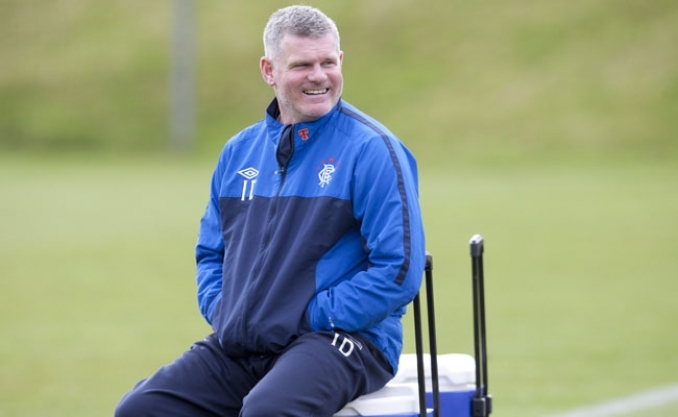 It was surely no coincidence that a term in which Durrant played as many as 39 games, Rangers won the Championship. That side also took the League Cup, winning 2-1 against Celtic, thanks in part to the No.10’s opening strike in the final. The 87/88 season saw the Championship go elsewhere but the League Cup was retained in one of the great finals of the modern era. Aberdeen and Rangers slugged it out to finish 2-2 after ninety minutes. And, when extra-time saw no further breakthrough, the match went to penalties. As we all know, it was the Govan boy’s spot-kick that decided the tie and he stood, arms aloft in that famous ‘Victory V’ salute. Almost exactly a year later, tragedy struck at Pittodrie when a shocking challenge from Simpson left Durrant with a shattered right knee. One could not have guessed that night that it would be almost three years before he was once again able to wear the beloved blue. The day he finally did in April ’91 at home against Hibs, 35,000 stood as one to welcome him back. Two seasons later saw extraordinary success for club and player alike with a domestic treble and unqualified success in Europe, including “Durranty”‘s memorable strike to quell the hostile atmosphere of Marseille during the European campaign. While his career at Rangers, with its 347 appearances spawning 45 goals, continued through till ’98, those early ’90s campaigns will remain in the memory as the great Durrant years and his tally of 3 Championship, 3 Scottish League and 4 League Cup medals speaks for itself. He moved to Kilmarnock where he was hugely successful and influential, forcing his way back into the Scottish national team. He then joined the coaching staff under Jim Jefferies. However, the lure of Ibrox was too tempting when he was asked to come back in 2005 to firstly run the under-19 side then the Reserve team.